A - B - Seymour: I'm Baaaack with an Updated Halloween Pack Giveaway!! I'm Baaaack with an Updated Halloween Pack Giveaway!! The beginning of this year has been a little rough to say the least. Every school year seems to demand more and more. I just needed to take a break from the blogging world and keeping up with TpT. I think I'm ready to come back now. I've really missed blogging and sharing things. I have taken so many pictures and I think I'll blog about that, but then I never seem to have the time to sit down and blog. 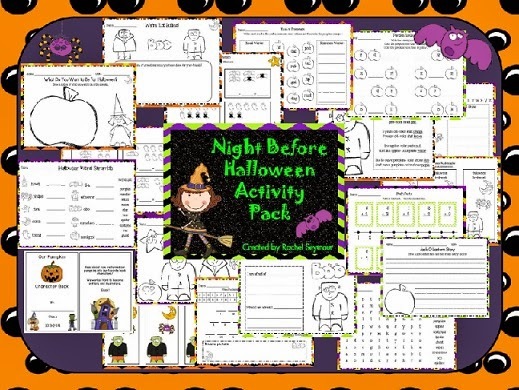 This pack is full of fun Halloween activities. You can use them on a sub day, when you're progress monitoring your kiddos, or when you need a few minutes to get some make-up work done. It seems like I am always needing a few minutes to get something done! I always read The Night Before Halloween by Natasha Wing to my kiddos every year. They love it so I highly recommend it with this pack! Click on the book below to purchase it on Amazon! 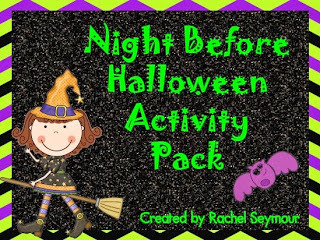 Since I have been gone for sooooo long I am giving this pack away to the *first 10 people* who leave a comment with their email address below sharing their favorite Halloween activity as a thank you for sticking around my blog! I know what you mean. Each school year demands more. You're Halloween pack looks great! Don't feel so bad, we all know what it's like trying to manage school, blogging, TpT, AND family! Your Halloween pack looks great. I love to do a lot of pumpkin activities and games that I can use candy corn with! I'm on my third bag so far and I just took 2 bags to school. Yikes! I hear you! After this many years, you'd think it would be easier each year, but maybe back then we didn't have so much to worry about! Glad you are back...but don't stress about keeping up with your blog on top of everything else. I am happy to read whenever you post. I love doing graphing activities with halloween candy! The kids love it too! I live having pumpkin day in the classroom. Everything pumpkin! Graphing, adjectives, etc. I love the school halloween carnival and carnival pumpkins. My daughters favorite book is the old lady who swallowed a bat. I love our school's giant Halloween parade! I'm so glad you and your ideas are back:)! I love all of the Halloween books (Spookley the Square Pumpkin, Even Monsters Need Haircuts, Hallo Wiener)! I am so excited to go to the farm! Pumpkin patches are definitely one of my favorite Halloween activities! Glad you're back! I know how you feel, Rachel. I've been having troubles keeping up, too! I love watching the kids trick or treating! Love your Halloween ideas! Isn't it funny that you can miss doing something that often stresses you out?! Bat Freebies and on Bloglovin'!